–Surprisingly compelling thriller and morality tale. The film delves into the politics and ethics behind the search for WMDs during the Iraq War. –Women rule the underworld in Tim Burton’s trippy take on the classic children’s story. Red Queen vs. White Queen while a plethora of dreamy and psychedelic encounters abound for a confused Alice. –Landing a cushy writing gig for a former-Prime Minister involves sleuthing and peril in this exceptional, taut thriller. All films are currently in theaters. The two Lorkowski sisters have a traumatic past and cope in their own ways: Rose [Amy Adams] is a workaholic; and Norah [Emily Blunt] is an unreliable slacker. Once a popular high school cheerleader (cannot believe that this still holds so much cache even today), Rose struggles to stay above water as a single mom with dreams of better things for her son and herself. In reality, someone as cheery and energetic as Rose [particularly as vibrantly played by Adams] should and would be running the entire cleaning company or have her real estate license by now. Norah is moody and brooding and kinda punk with the obligatory smudged eyeliner and funky second-hand wardrobe. She sleeps too late to get into work on time and half-asses her shifts as a waitress. The sisters fight but of course truly care for each other. On somewhat of a whim and a lot of frustration, the sisters embark on an unusual enterprise: biohazard removal/crime scene clean-up. This forces them to handle the aftermath of suicide, body decomposition, as well as bodily fluids and other unexpected messes for which they are completely untrained and unprepared for but face with that little bit of hope and can-do spirit to potentially get them out of the slump that is their life. It is fairly predictable [and borrow elements from many other well-loved indie films] but the cast is great [including Alan Arkin as the girl’s eccentric, cranky father]. 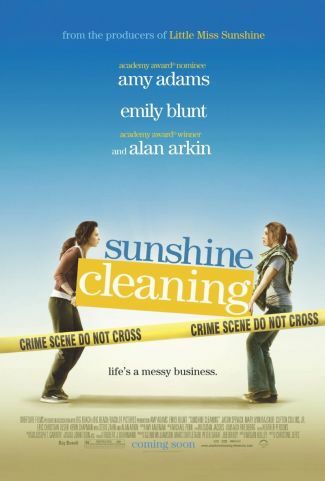 Sunshine Cleaning is that typical indie film that combines just the right amount of quirkiness with darkness, laughs and touching moments. What makes it worth the trip to the theater? Amy Adams and Emily Blunt make a fabulous acting pair. When divorce attorney, Robert (Patrick Dempsey) remarks his logical engagement is not like that of a feuding couple in his office: “those people got married on a crazy romantic whim” it sets the tone of Enchanted right away. It’s not going to be one of those movies. Instead, it’s a treasure and welcome surprise. For this past year, Waitress is another winner in that respect. Giselle (Amy Adams), a princess from a magical land where chipmunks talk and animals do the cleaning and deliver messages, finds herself catapulted into Times Square. An oblivious and adorable Prince Edward bandies his sword with bravado while he searches for Giselle (“I seek a beautiful girl. My one coquette. The answer to my love’s duet.”). At first Giselle is wide-eyed and trusting and slowly she starts to question her notions of happily ever after. Amy Adams delights and shines. If you didn’t notice her sparkle in Junebug, you’ll surely be charmed here. Go-to romantic comedy guy James Marsden. No Disney film is complete without poison (here disguised in every urban manner imaginable– an apple martini, a caramel apple), a wicked witch (a marvelous Susan Sarandon, reminiscent of Michelle Pfeiffer in Stardust) and expansive dance productions—here tongue-in-cheek yet colorful and sincere and yes, catchy. Questioning the dated aspects of typical Disney heroines and presenting a strong, independent woman with choices makes all the difference in the world. A witty script, divine casting and the animated, without being cartoonish, acting fuels this film. Enchanted is smart, whimsical, funny and totally winning.